Lattices benefit from a fresh coat of paint. Lattices are large sections of criss-crossed wood strips, which can be a real pain to paint. It's the right thing to do, however, because painting or staining your lattice will enhance any space you're placing it, whether it's a garden, deck, porch or fence. Avoid spending a lot of time tediously digging your paint brush into the small corners of each criss-cross in the lattice pattern. It's best to use spray paint on your lattice. 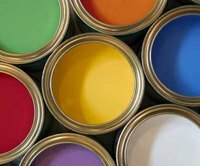 Choose cans of spray paint, or rent a paint sprayer at a hardware or home improvement store. Buy exterior primer and paint in the color of your choice. If you're repainting an old lattice, clean off any dirt, cobwebs or dust that will prevent the paint from adhering properly. Wash the lattice down with a hose, and let it fully dry. Sand areas where the wood is splintered. Find a well-ventilated area. Lay a collection of newspapers flat on the ground, enough to provide a few feet of coverage all the way around your lattice when it's laid out on top of them. Begin the spray motion with your hand before you push the sprayer button, then push the button, making sure you continue moving the whole time. Do not release the button on the sprayer until it's off the surface of the lattice. Repeat this process until the lattice is covered. This method will prevent primer and paint from being darker or thicker in one area more than another. Allow the primer to dry fully before applying primer to the other side. When the second side is dry, begin applying the base color. Always keep the sprayer the same distance from the surface, for consistent saturation and coverage. Using the same method you used to apply the primer, apply several very thin coats of spray paint. If you have settings on your sprayer, set it to a fine mist. Allow the paint to dry between applications of each coat. Continue to apply paint until the primer is completely covered. Allow one side to dry before repeating this process on the other side.